High Holy Days are a time for reflection, introspection, prayer, and re-connection. Join us in experiencing the spirituality of the High Holy Days. We observe the service of Selichot at the start of Rosh Hashanah, before the beginning of the ten day period of penitence and introspection ending on the fast day of Yom Kippur. In our services, we use the two-volume set of Mishkan HaNefesh, the text of which reflects our interest in gender-sensitive language. 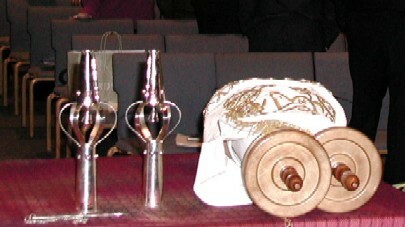 Membership in Bet Aviv includes admission to High Holy Day services. As a gesture of hospitality, you may invite your parents, children and grandchildren to attend at no additonal cost. Please see the Schedule of Services for a list of dates, times, and locations of services. Last year, a trio of congregants called us to worship with the sound of the shofar. A special highlight of our Yom Kippur service is hearing the haunting melody of the Kol Nidre played by a professional cellist. After the final blast of the shofar, Bet Aviv continues its annual tradition of celebrating the new year together with a Break-the-Fast meal. As a reminder, please bring your Mishkan HaNefesh prayer books with you to services, as we have only a limited number for guests. Also, please remember to stop at security for check-in prior to entering the sanctuary so that we can be informed of your presence. If you are not a member of the congregation and not yet ready to make that committment, you may purchase a seat at our High Holiday services to join us. If you decide to join the congregation shortly after the holidays have ended, we will apply the ticket costs toward your membership dues! Please contact us for details. The Union for Reform Judaism suggests, where space allows, that those members in good standing at Union congregations who will be in another community during the High Holy Days be welcomed to worship. If you will be traveling during the holidays and wish to attend services at a URJ member synagogue, download and fill out the “High Holiday Courtesy Seating Request.” Then forward this form to the Bet Aviv office where it will be completed and mailed to your destination congregation.